Child themes are the saving grace of all WordPress developers who are testing the waters on theme development; who want to edit their themes without the imminent threats of breaking the entire website at a code error and losing the changes after a theme upload. While most people get overwhelmed with the concept of how to create a WordPress Child Theme, the process is actually quite simple. 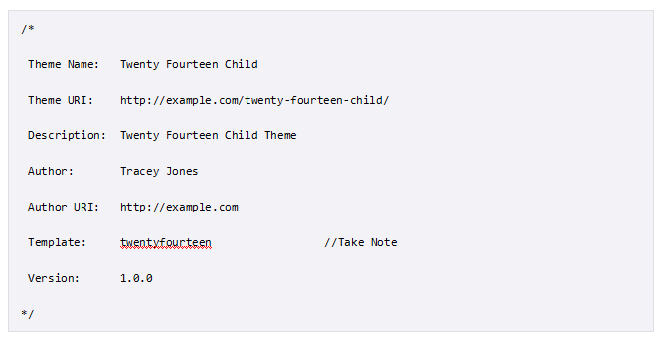 Child themes work by inheriting the style and functionality of another (called ‘parent’) theme. And since I’m an analogy junkie: Think of it as a transparent plastic-overlay which you can paint on without actually making any changes in the original piece of art. This is as simple as creating a new folder. In your WordPress directory, go to wp-content/themes. Create a new directory and name it after your Child theme. Note that it is considered good practice (but not a necessity) to name your child theme after the parent theme. For e.g., if you are creating a child theme for Twenty Fourteen theme, you should name the Child theme: twentyfourteen-child. Remember: No spaces in the name to keep errors at bay! If you want to go an even easier route (or don’t want to access FTP or shell-account): Install One-Click child theme plugin, which will give you a ‘Child Theme’ option right under the ‘Themes’ and create a child theme for the theme that’s currently active. This is the fun part, and we will do it in two steps. Chop shop! We created a stylesheet to live inside the newly created child-theme directory. This is one of the two files that are mandatory. So basically, from now on, any CSS changes you want to make, start right here. The most important parts of that bit of code are Theme name (required) and Template, which corresponds to the template file in the parent theme directory. Since we are working with Twenty Fourteen, that’s the template we called. You, of course, need to adjust this (and the rest of the data) accordingly. We have aligned the WordPress template, and now we can add the CSS. There are two ways to do that. Or you can go with the correct method of enqueuing the parent theme stylesheet using wp_enqueue_scripts and wp_enqueue_style() in the child theme’s functions.php file (a better practice for performance, as suggested by Google and Yahoo). You can remove get_template_directory_uri() if your parent theme does not use more than one stylesheets. Your child theme’s style.css will load automatically and override the stylesheet we called from the parent theme. This is as simple as it could get. There’s an interesting use of a child-theme’s functions.php. Since it is loaded before the parent theme’s functions-file, you can make the user functions of the theme ‘pluggable’ (read: replaceable by a child theme) by the simple process of declaring them conditionally. When (not) to make a child theme: Developers often go overboard at using child themes. Reserve it for when you need to make larger changes (than background colors and typography). But if you’re thinking of editing the entire layout, structure, and functionality; create a new theme instead. Overwriting functions in parent theme: check your child theme functions with function_exists(), everytime. There are so many things you can do with child themes. Just look at WooThemes, who are now selling pre-designed child themes of their Storefront theme. And if you have some child-theme tricks, share them with us in the comments below. Tracey Jones is professional WordPress developer and currently working with HireWPGeeks, a leading Druapl to WordPress theme conversion company across the globe. When she is not developing web sites she loves to write excellent stuffs related to WordPress and socializes it through social media platforms.